Summer is the best time of year for simple meals with the biggest flavor payoff because there is such a wealth of fresh ingredients available. With a 4 month old whose main mission in life is to monopolize as much of my time as he possibly can, it’s a necessity for dinner to come together FAST. I definitely don’t want to compromise on the flavor of the food that we are eating every night, so it’s just as important for the food to taste great. This is honestly one of the most satisfying meals to make for my family. Not only do I make this often for Sergi and myself, but it’s also great for company. I almost always have pesto in my freezer, so it takes only 15 minutes of prep time to get all the ingredients ready for cooking and the rest of the meal comes together in the time it takes the pasta to cook. 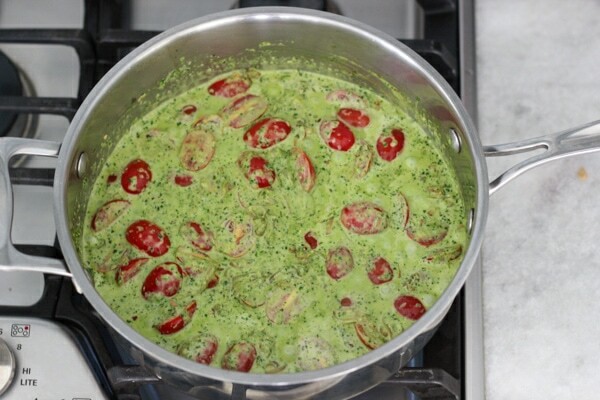 The pungent and aromatic pesto sauce coats the pasta with such a beautiful vibrantly green sauce. The cherry tomatoes not only bring a pop of color to the dish, but they are so juicy and crisp. Shallots, garlic, parmesan cheese and just a hint of spicy red pepper flakes round it all out with such a perfect balance of seasoning. 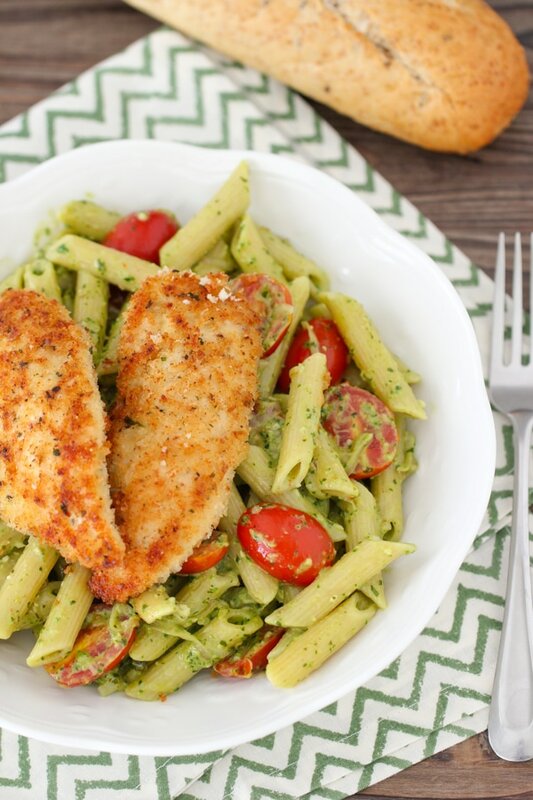 Crispy, breaded chicken tenders accompany this pasta dish perfectly, but you can use chicken breast, turkey breast or even shrimp. 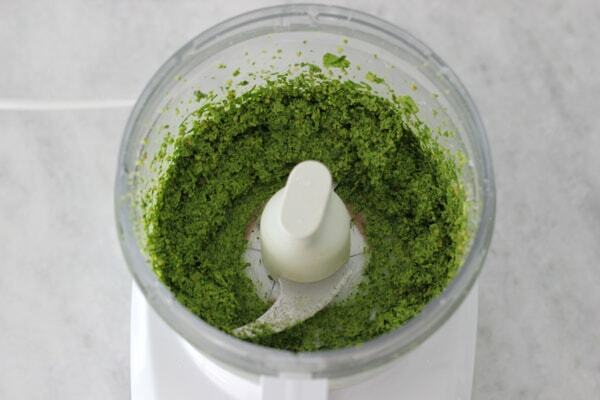 Make the pesto sauce first, or use store bought pesto. 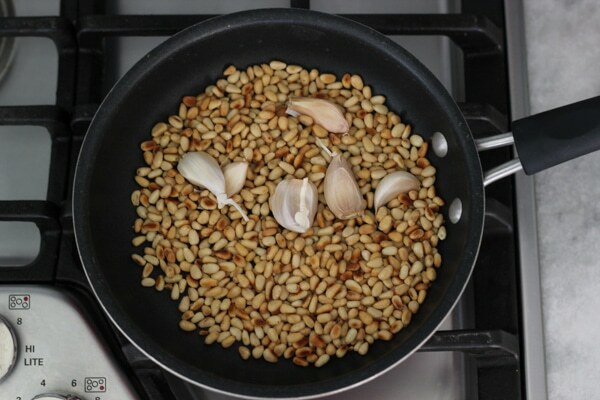 In a dry skillet, toast the pine nuts along with the unpeeled garlic cloves. The pine nuts will toast much faster than the garlic cloves, so take them off the heat once they are golden and continue toasting the garlic cloves until they are golden and spotty. Cool the pine nuts and the garlic slightly. 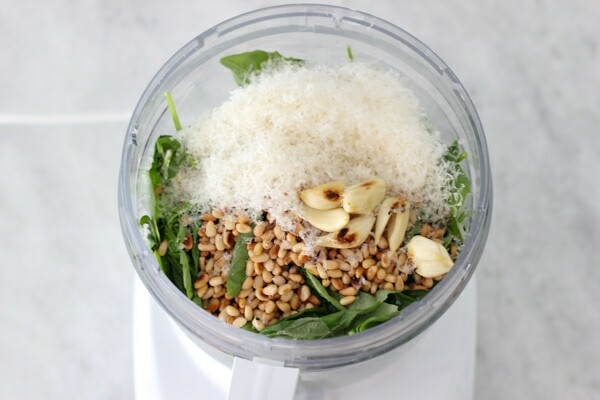 Peel the garlic cloves and place them into a food processor along with the pine nuts, basil, spinach and Parmesan cheese. Pulse in the food processor until finely chopped. With the food processor running, slowly pour in the olive oil. 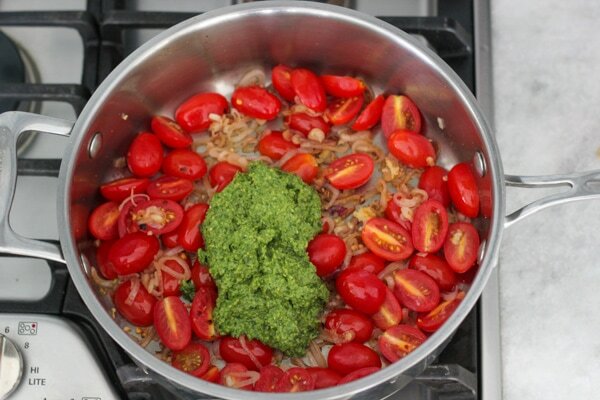 This recipe will yield about 3/4 cup of Pesto Sauce. I usually make a double batch and freeze the second half. When you have pesto on hand, you have so many options for quick and really flavorful dinners on a busy night. Of course, you can use store bought pesto sauce. 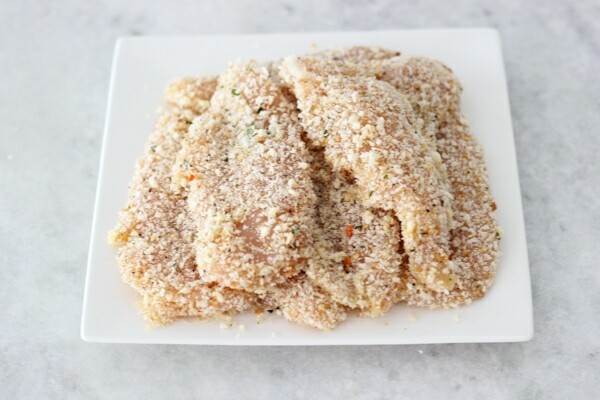 Dip the chicken tenders in the beaten egg and then dredge in the seasoned breadcrumbs. 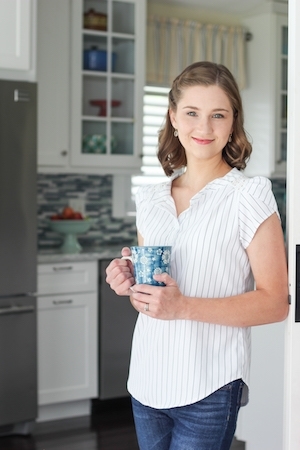 I like to have homemade breadcrumbs on hand. This is the recipe that I use. They taste so much better than store bought breadcrumbs. Plus, it takes less than 5 minutes to mix all the ingredients together and store them in your pantry. Make sure to pack the breading on with your hands so it would adhere better. 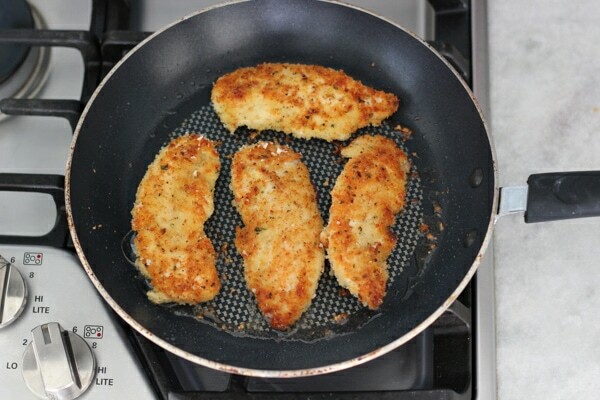 Instead of chicken tenders, you can cut chicken breast into strips, or use turkey breast. Instead of poultry, you can sear some shrimp. Bring a large pot of salted water to a boil for the pasta. Prep all your ingredients while you are waiting. This meal cooks so quickly, you want to have all your ingredients prepped and ready to go. Cook the pasta according to the level of doneness that you like. Reserve about 1 cup of the pasta water. Meanwhile, in a large nonstick skillet, heat 2 Tablespoons of oil on medium high heat. 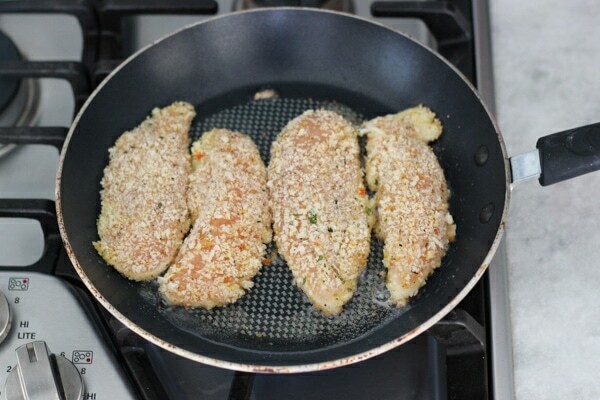 Add half of the breaded chicken tenders and cook on medium heat until golden on both sides, 2-4 minutes per side. Take the chicken tenders off the heat and set aside on a plate, tented loosely with aluminum foil or a clean kitchen towel to keep warm. Repeat with the second half of the chicken tenders. Instead of breading the chicken, you can simplify it by just seasoning it with salt and pepper and sautéing it. I’ve done it this way plenty of times and it tastes great too. In another deep skillet, heat the remaining Tablespoon of oil and add the sliced shallots. Cook for about 2 minutes, until tender. Add the halved cherry tomatoes, minced garlic and crushed red pepper. Season with salt and pepper and cook on medium heat for about 1 minute. Add the pesto sauce and cook for about a minute, just until heated through. At this point, you can also add a large handful of spinach to the dish. it will wilt really quickly and is a great addition to this pasta dish. Pour in the heavy cream and mix to combine. Add the cooked pasta to the skillet, mix to combine. Gradually add the reserved pasta water, as much as you think it needs. 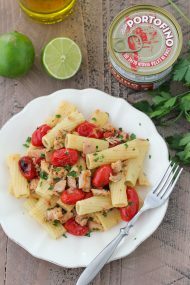 The hot, starchy pasta water is a great way to loosen the sauce without making it too watery. Serve immediately along with the breaded chicken tenders. In a dry skillet, toast the pine nuts along with the unpeeled garlic cloves. The pine nuts will toast much faster than the garlic cloves, so take them off the heat once they are golden and continue toasting the garlic cloves until they are golden and spotty. Cool the pine nuts and the garlic slightly. Peel the garlic cloves and place them into a food processor along with the pine nuts, basil, spinach and Parmesan cheese. Pulse in the food processor until finely chopped. With the food processor running, slowly pour in the olive oil. This recipe will yield about ¾ cup of Pesto Sauce. I usually make a double batch and freeze the second half. When you have pesto on hand, you have so many options for quick and really flavorful dinners on a busy night. Of course, you can use store bought pesto sauce. Dip the chicken tenders in the beaten egg and then dredge in the seasoned breadcrumbs. Make sure to pack the breading on with your hands so it would adhere better. 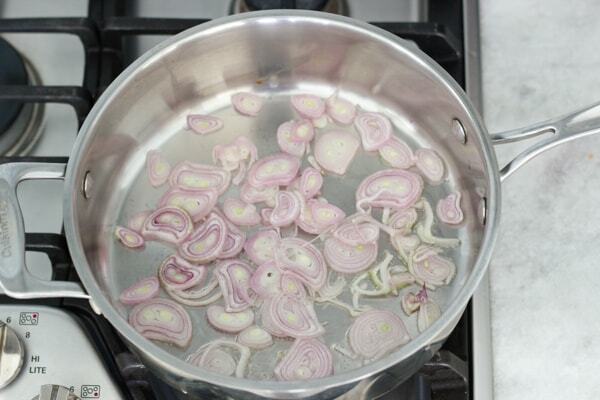 In another deep skillet, heat the remaining Tablespoon of oil and add the sliced shallots. Cook for about 2 minutes, until tender. 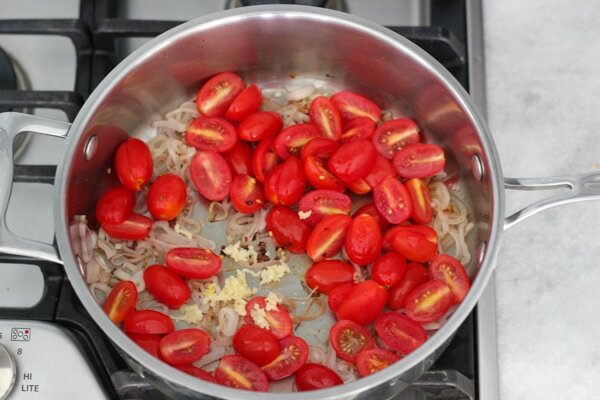 Add the halved cherry tomatoes, minced garlic and crushed red pepper. Season with salt and pepper and cook on medium heat for about 1 minute. Add the pesto sauce and cook for about a minute, just until heated through. At this point, you can also add a large handful of spinach to the dish. it will wilt really quickly and is a great addition to this pasta dish. Pour in the heavy cream and mix to combine. Add the cooked pasta to the skillet, mix to combine. Gradually add the reserved pasta water, as much as you think it needs. The hot, starchy pasta water is a great way to loosen the sauce without making it too watery. 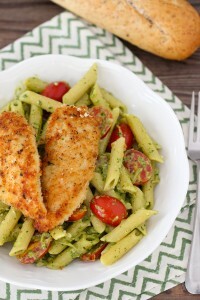 I haven’t made my own pesto yet but this looks like a perfect recipe for a weeknight dinner! This looks sooo tasty! I have pesto in the freezer! 😉 just one question- could I use just regular onion? Or do the shallots make a big difference? Absolutely delicious! Made it last night, and it was amazing. 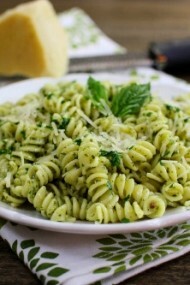 I just love garlic and basil combo, and all other ingredients in this recipe, great flavors. I used panko bread crumbs and added all other flavorful ingredients to it. It really brought up chicken to a whole new level. I tried white fish fillet that was covered with pesto sauce and cheese on top at one of the restaurants when we went on vacation. It was one of the most flavorful ways to cook fish. Fish fillets were rolled, and looked like roses covered with pesto and melted cheese on top. That was the moment when I fell in love with pesto sauce. Have you tried pesto sauce with fish? I made this pasta the other day just with fish instead of chicken.. And for pesto I used walnuts and almonds since I didn’t have any pine nuts on hand and everything turned out really good.. I was intimated by pesto before but it’s really good. I guess now i know. Next on my list is your beef fajitas and crab cakes! 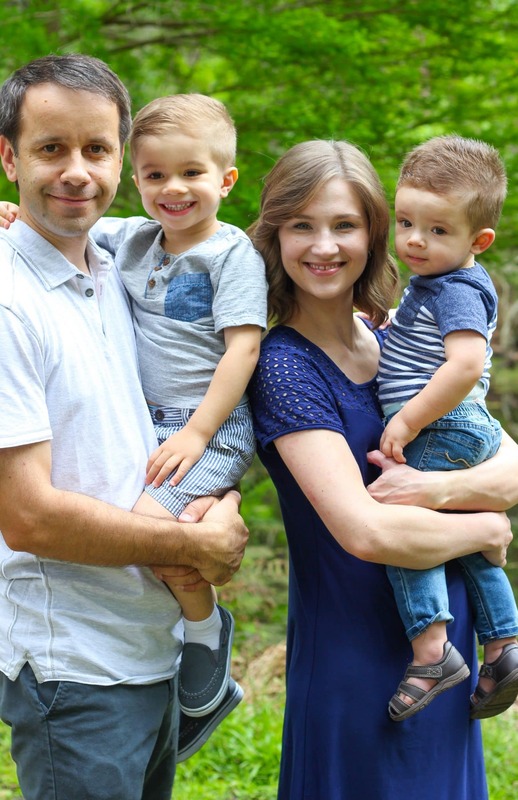 Thanks for all your great recipes! 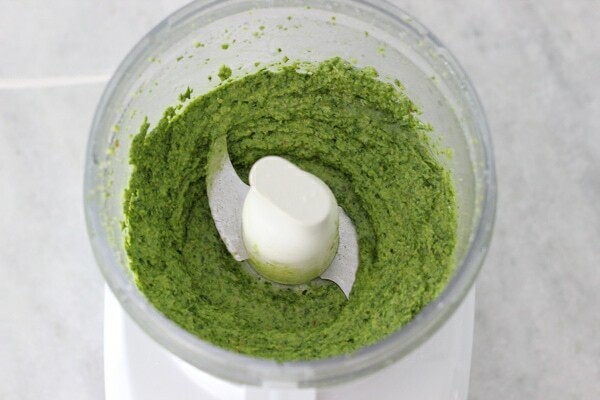 Pesto really is so easy. I’m glad you enjoyed this recipe, Masha. Thank you for taking the time to write. I’d love to hear what you think of the Fajitas and Crab Cakes as well. 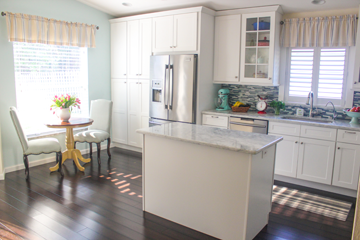 My family loves home cooked as opposed to quick and easy. This meal was both! 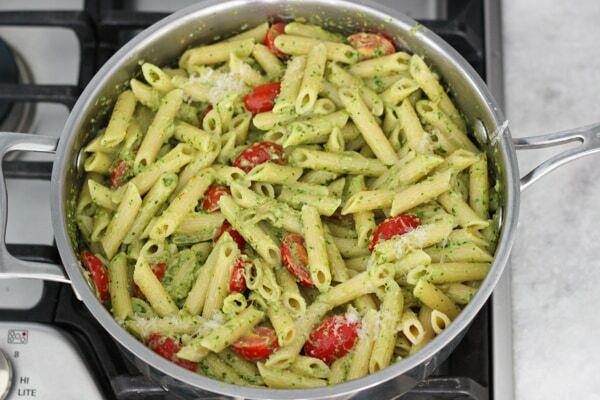 I had never tried pesto with pasta, but this will be one of our new favorites!